Here is the latest news about jobs in the different department of the University of health science Lahore. Jobs Opportunity is available in UHS Lahore latest jobs in 2019. You can take great advantage from these jobs. If you have a Master's & Graduation degree then you must apply for these jobs. Job searchers who are already working as government & semi-government should apply for jobs through proper channel. How to Apply for UHS Lahore Jobs 2019? Application convoyed with all attested copies of Academic documents, Degree, Certificates, CNIC, Domicile and recent 4 passport size color photograph should reach Office of Director of the University by April-02-201 & Applicants will have to attach a paid bank draft of Rs. 1000/- along with application form in favor of Treasurer university of health science (UHS) Lahore. 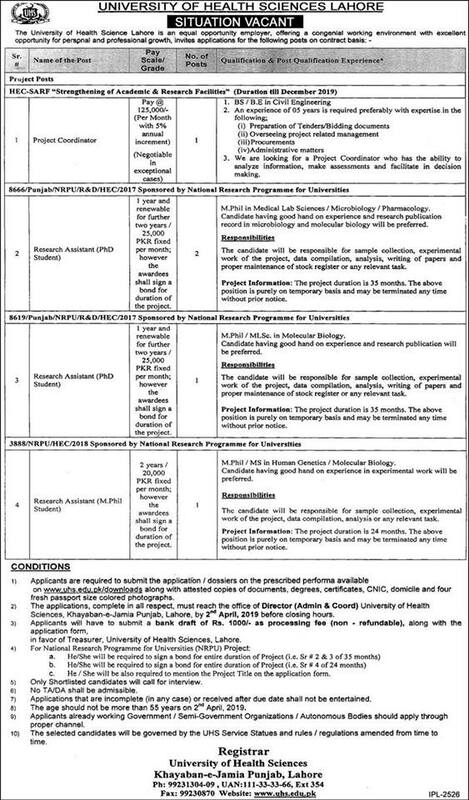 Office of Director (Admin & Coord), University of Health Sciences, Khayaban-e-Jamia Punjab, Lahore.